The three-year (2015-2018) EU Horizon 2020 BigDataEurope (BDE) project aims to undertake foundational work to publish, manage, integrate, distribute and use of multi-lingual and semantically interoperable large-scale data assets and knowledge. The Food and Agriculture H2020 societal challenge of this project is tackled by FAO of the United Nations and Agroknow. The BigDataEurope: Integrating Big Data, Software & Communities for Addressing Europe's Societal Challenges (BDE) project is funded under the H2020 Work Programme Strategic Objective ICT 15 - 2014: Big data and Open Data Innovation and addresses the Target Outcome (b.3) Coordination & Support Actions: Data Aggregator Platform. design and implement an architecture for such an infrastructure able to meet the needs of related communities pertaining to Europe’s major societal challenges. # BigDataEurope provides this video to introduce the infrastructure and services. the established or evolving processes and bodies that will drive the system’s evolution and adaptation to further markets and to future market needs. These tools and mechanisms should be installed and used freely (as open-source components) in a customised chain with minimal knowledge of the technologies involved. All related (to the project) European research results and prototypes will be integrated into a Big Data Integrator Platform. This latter will present an ecosystem of specifications and reference implementations that are both attractive to current players from all parts of the data value chain while also lowering the entry barrier for new businesses. In this framework, FAO (with support from the Global Forum on Agricultural Research (GFAR)) is the domain partner and AgroKnow is the technical partner of the BDE project. One of the main challenges in agricultural data management is the variety of data types and sources that are typically used in agricultural, food and environmental research. This is what you get, if you contrast the four (as IBM suggests) V’s of big data to the data types and sources that are typically used in agricultural, food and environmental domains. We are not talking about an extremely large Volume; other domains have much more voluminous data. It is not that they come with a high Velocity, especially compared to other domains. In many cases, their Veracity is quite high. But in agriculture, data Variety matters: you need to combine multiple, heterogeneous data types and formats from several sources, trying to solve the information problems and support decision making of the relevant stakeholders. FAO helps to encounter these challenges in different ways. First of all, in synergy with other partners, FAO is investigating how different project use cases already meet (in order to avoid duplication) the challenges of big data approaches in agri-food sector. Secondly, FAO is engaging different agricultural stakeholders to understand their data and technologies used and needed. The first BDE workshop on “Big Data for Food, Agriculture and Forestry”. Organized by FAO, AgroKnow and the Semantic Web Company. The workshop included six presentations by selected professionals from high class research institutions and an interactive part to get input from more than 40 experts from around the world. The workshop took place in conjunction with the Interest Group on Agricultural Data (IGAD) Pre-Meeting of the sixth Research Data Alliance (RDA) Plenary and was hosted by the Institut National de la Recherche Agronomique (INRA). 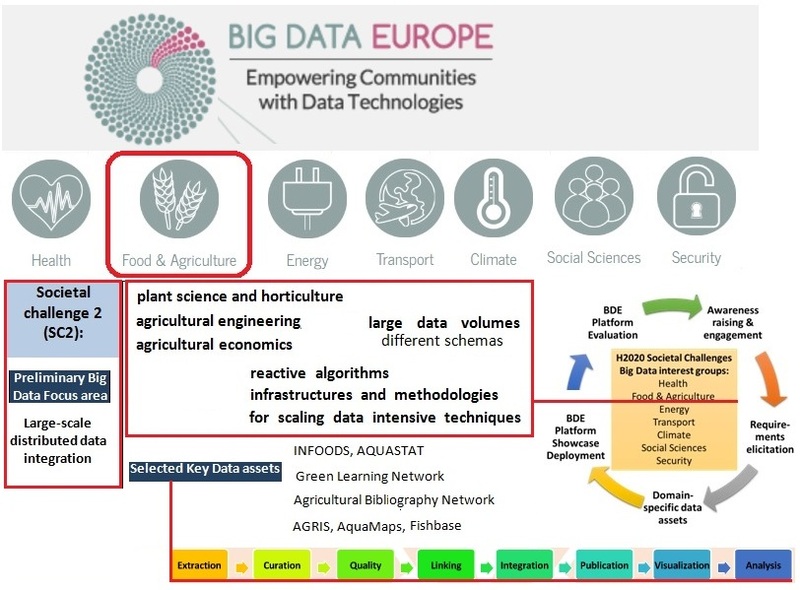 The main finding of the event is the big challenge of high data variety in the area of agriculture: multiple, heterogeneous data types and formats from various sources have to be combined. Organized by FAO and AgroKnow and with support from the GODAN initiative and the INRA. The workshop involved a selected group of EC representatives that are working on agendas or initiatives of relevance (from DG AGRI, DG CONNECT, DG RTD as well as the EU Publications Office) to meet a number of experts from key non-EC organizations and companies working on data for food and agriculture (FAO, CGIAR, GODAN, INRA, Alterra, WUR, TNO, Syngenta, AgroKnow). The one-day workshop took place at the CLORA premises and followed the DG AGRI “Digitising the Agri-food Sector” meeting that had taken place the previous two days also in Brussels. Organizing the workshop back-to-back with the DG AGRI meeting gave us the opportunity to have some members of the BDE project and some key partners invited to the DG AGRI meeting and to get a full report of the meeting during the BDE workshop. In 2015, AgroKnow and FAO started a BDE webinar series in conjunction with the Webinars@AIMS. The list of stakeholders for outreach by the project (experts made aware of the project and involved in consultations) now includes 193 people. AgroKnow is responsible to demonstrate the use of the big data platform in a use case relevant to in Social Challenge 2. The first Pilot Cycle for Social Challenge 2 is already completed. The goal of the first Pilot Cycle was to demonstrate and evaluate the ability of BDE proposed technologies to complement existing community-driven systems (e.g. VITIS for the Viticulture Research Community) with efficient large-scale back-end text-mining workflows, which can utilize any Spark-based Natural Language Processing (NLP) module. The first Pilot Cycle demonstrated the ability of BDE proposed technologies to setup efficient large-scale back-end processing workflows. In the third year of the project, the main priority for FAO will be the organization of the third community workshop and the delivery of two webinars. The webinars will be focused mainly on the technical pilot, which uses instances of the BDE platform for SC2, whereas the workshop will focus on future developments for the definition of a roadmap for a big data infrastructure for food and agriculture. Other important activities will be around the dissemination of results, the gathering of feedback and the enlargement of the audience of experts and institutions potentially interested in the results of the project. Shared data services (big data platforms, e.g. big-data empowered learning mechanisms) and agreed reference datasets (as standards and for learning mechanisms). Check out the BDE website for recent developments and pilot use cases in agricultural data.